Married Name 10 August 1926 As of 10 August 1926,her married name was Smith. Enid Glenda Leeper was born on 24 January 1893 at Garden Plain, Sedgwick, Kansas. She was the daughter of Harvey Ellwood Leeper and Delilah Amos Crotchett. Enid Glenda Leeper married Henry Harry Smith on 10 August 1926 at Corvallis, Benton, Oregon. [S243] U.S. Federal Census 1920 U.S. Federal Census, by Ancestry.com, ED85. Dwelling 262. Name Variation Verna Marie Leeper was also known as Vernia. 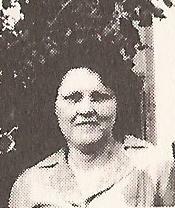 Verna Marie Leeper was born on 17 June 1893 at Lyon, Kansas. She was the daughter of William S. Leeper and Margaret Mable Crotchett. Verna Marie Leeper died on 3 September 1907 at age 14. She was buried after 3 September 1907 at Lemoore Cemetery, Lemoore, Kings, California. Name Variation Mary Delilah Leeper was also known as Marie. Married Name 15 September 1925 As of 15 September 1925,her married name was McGorray. Mary Delilah Leeper was born on 29 October 1903 at Greenwood, Kansas. Mary Delilah Leeper married Horace James McGorray on 15 September 1925 at Fresno, California. Name Variation William Clinton Leeper was also known as Clinton. William Clinton Leeper was born on 25 September 1906 at Fresno, California. He was the son of William S. Leeper and Margaret Mable Crotchett. William Clinton Leeper married Martha Louise Long, daughter of (?) Long, on 18 June 1926 at at a home wedding, Hanford, California. William Clinton Leeper died on 18 August 1942 at Kings, California, at age 35. [S250] U.S. Federal Census 1930 U.S. Federal Census, by Ancestry.com, ED1-157. Dwelling 159. Thomas Allen Leeper was born on 30 June 1908 at Lemoore, Kings, California. 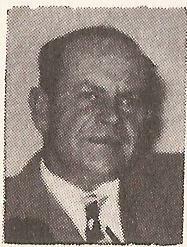 Thomas Allen Leeper married Irene Mae Hendricks on 15 February 1936 at Newark, California. 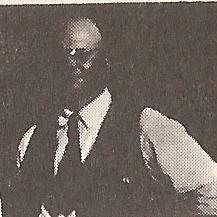 Thomas Allen Leeper obtained US Social Security Card at California; last residence Twain Harte, Tuolumne, California. Married Name 14 October 1933 As of 14 October 1933,her married name was Frisius. Anna Loree Leeper was born on 21 February 1910 at Lemoore, Kings, California. Anna Loree Leeper married Fredrick Grant Frisius on 14 October 1933 at Beverly Hills, California. Anna Loree Leeper died on 28 January 2004 at age 93 Anna L. Frisius, 93, of Grass Valley died Wednesday, Jan. 28, at a local care facility. No services are planned. Burial will be at the Mountain View Memorial Park Mausoleum in Altadena. She was born Feb. 21, 1910, in Lemoore to William S. and Margaret M. Leeper. She graduated from Reedley High school in Reedley in 1928. She attended a school of nursing and worked for the Los Angeles County General Hospital as a registered nurse for 35 years. She married Fredrick G. Frisius Oct. 14, 1933, in Beverly Hills. She is survived by her sons and daughters-in-law William G. and Hildi Frisius of Springfield, Va., and Lee F. and Gina Frisius of Keauhou, Hawaii; four grandchildren; and two great grandchildren. Name Variation Rosa Dell Felkel was also known as Rosey. Rosa Dell Felkel was born on 17 February 1878 at Fulton, Illinois. She was the daughter of John Felkel Jr. and Sarah E. Childers. Rosa Dell Felkel died on 10 September 1975 at Greenwood, Kansas, at age 97 Mrs Charles E Crotchett (Rosa Dell Felkel) obituary. She was buried after 10 September 1975 at Lena Valley Cemetery, Greenwood, Kansas. 1915 Shell Rock, Greenwood, Kansas Rosa Dell Felkel appeared on the census of 1915 in the household of Charles Elmer Crotchett at Shell Rock, Greenwood, Kansas; living next to Fred Austin. [S246] U.S. Federal Census 1880 U.S. Federal Census, by Ancestry.com, NA Film Number T9-0208 Page Number 284B. Married Name 26 June 1931 As of 26 June 1931,her married name was Yount. Bernice Cleone Crotchett was born on 20 September 1901 at Lyon, Kansas, also reported as 20 Sep 1900; also reported as Madison, Wisconsin. She was the daughter of Charles Elmer Crotchett and Rosa Dell Felkel. Bernice Cleone Crotchett married Wayne N. Yount on 26 June 1931 at Kansas City, Missouri. Bernice Cleone Crotchett died on 17 May 1977 at Kansas at age 75 Mrs Wayne Yount (Bernice Crotchett) obituary. 1915 Shell Rock, Greenwood, Kansas Bernice Cleone Crotchett appeared on the census of 1915 in the household of Charles Elmer Crotchett at Shell Rock, Greenwood, Kansas; living next to Fred Austin. Bernice Cleone Crotchett had zero children. She obtained US Social Security Card at Kansas; last residence Emporia, Lyon, Kansas. [S250] U.S. Federal Census 1930 U.S. Federal Census, by Ancestry.com, ED89-28. Dwelling 137. 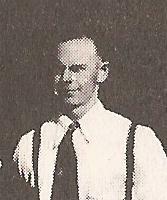 Wayne N. Yount was born circa 1903 at Kansas. He married Bernice Cleone Crotchett, daughter of Charles Elmer Crotchett and Rosa Dell Felkel, on 26 June 1931 at Kansas City, Missouri. Wayne N. Yount died on 7 September 1940. Wayne N. Yount had zero children. Name Variation Oran Lee Austin was also known as Oren. Oran Lee Austin was born on 10 July 1904 at Madison, Greenwood, Kansas. He was the son of Frederick Clarence Austin and Jannette Allen Crotchett. Oran Lee Austin married Flossie M. Erwin, daughter of Otis H. Erwin and Hazel D. (? ), on 8 August 1929 at Eureka, Kansas. Oran Lee Austin died in November 1979 at age 75. 1 May 1905 Elmerdaro, Lyon, Kansas Oran Lee Austin appeared on the census of 1 May 1905 in the household of Frederick Clarence Austin at Elmerdaro, Lyon, Kansas; living next door to Thomas Crotchett. 1915 Shell Rock, Greenwood, Kansas Oran Lee Austin appeared on the census of 1915 in the household of Frederick Clarence Austin at Shell Rock, Greenwood, Kansas; living next to Charley Crotchett. Oran Lee Austin obtained US Social Security Card at Kansas; last residence Chanute, Neosho, Kansas. [S250] U.S. Federal Census 1930 U.S. Federal Census, by Ancestry.com, ED37-9. Dwelling 156. Married Name 25 March 1928 As of 25 March 1928,her married name was Dugan. Mildred Austin was born on 26 September 1906 at Madison, Greenwood, Kansas. She was the daughter of Frederick Clarence Austin and Jannette Allen Crotchett. Mildred Austin married Clarence Elmore Dugan on 25 March 1928 at Arkansas City, Cowley, Kansas. Mildred Austin died in May 1972 at age 65. 1915 Shell Rock, Greenwood, Kansas Mildred Austin appeared on the census of 1915 in the household of Frederick Clarence Austin at Shell Rock, Greenwood, Kansas; living next to Charley Crotchett. Mildred Austin obtained US Social Security Card at Kansas; last residence Halstead, Harvey, Kansas. [S250] U.S. Federal Census 1930 U.S. Federal Census, by Ancestry.com, ED18-45. Dwelling 276. Name Variation Glenn Austin was also known as Glen. Glenn Austin was born on 17 April 1908 at Madison, Greenwood, Kansas. 1915 Shell Rock, Greenwood, Kansas Glenn Austin appeared on the census of 1915 in the household of Frederick Clarence Austin at Shell Rock, Greenwood, Kansas; living next to Charley Crotchett. Glenn Austin obtained US Social Security Card at California; last residence Azalea, Douglas, Oregon. Married Name Her married name was Toland. Name Variation Pauline Austin was also known as Polly. Married Name 3 May 1930 As of 3 May 1930,her married name was Morisset. Pauline Austin was born on 28 December 1910 at Madison, Greenwood, Kansas. Pauline Austin married Claud Morisset on 3 May 1930 at Hamilton, Kansas. 1915 Shell Rock, Greenwood, Kansas Pauline Austin appeared on the census of 1915 in the household of Frederick Clarence Austin at Shell Rock, Greenwood, Kansas; living next to Charley Crotchett. Pauline Austin obtained US Social Security Card at California; last residence not specified. Married Name 1 February 1933 As of 1 February 1933,her married name was Erwin. Helen Austin was born on 22 March 1913 at Madison, Greenwood, Kansas. Helen Austin married Clifford H. Erwin, son of Otis H. Erwin and Hazel D. (? ), on 1 February 1933 at Eureka, Kansas. Helen Austin died on 26 February 2007 at age 93. 1915 Shell Rock, Greenwood, Kansas Helen Austin appeared on the census of 1915 in the household of Frederick Clarence Austin at Shell Rock, Greenwood, Kansas; living next to Charley Crotchett. Helen Austin obtained US Social Security Card at California; last residence Wichita, Sedgwick, Kansas. Married Name 23 February 1935 As of 23 February 1935,her married name was Walford. Married Name 7 July 1976 As of 7 July 1976,her married name was Mall. Marie Austin was born on 23 May 1915 at Madison, Greenwood, Kansas. Marie Austin married Clyde David Walford on 23 February 1935 at Eureka, Kansas. Marie Austin married Clarence M. Mall on 7 July 1976. Marie Austin died on 9 July 2004 at age 89 Marie Mall, 89, died July 9 at Woodhaven Care Center in Ellinwood. She was born May 23, 1915, at Madison, the daughter of Fredrick Clarence Austin and Jeanette Allen Crotchett. 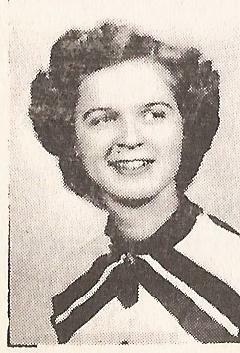 She married Clyde David Walford on Feb. 23, 1935, at Eureka. He died April 26, 1971. She married Clarence M. Mall on July 7, 1976, at Tescott. He died Nov. 3, 1987. A long-time Ellinwood resident, she was a homemaker. Mrs. Mall was a member of United Methodist Church, Rebecca Lodge, both of Ellinwood, Eastern Star No. 487 of Claflin, Heritage Club and volunteer worker at the Ellinwood Thrift Shop. Survivors include a son, Donald Dee Walford, Owasso, Okla; a daughter, Patricia Irene Schartz, Ellinwood; stepdaughter, Lucille Reeder, Wichita; sister, Helen Erwin, Wichita; stepsons Orville Mall of Seattle, Wash., and Roy Mall of McAllen, Texas; seven grandchildren, 14 great-grandchildren and three great-great-grandchildren. She was preceded in death by two brothers and two sisters. Funeral will be at 2 p.m. Tuesday at Kimple Funeral Chapel in Ellinwood with the Rev. Vernon Maelzer officiating. Burial will be a Hillcrest Cemetery in Great Bend. Friends may call from 1 to 8 p.m. Monday at the funeral home. Memorials are suggested to Ellinwood Ambulance Fund or Woodhaven Care Center, in care of the funeral home. Name Variation John Owen Crotchett was also known as J. O. Name Variation John Owen Crotchett was also known as Little John. John Owen Crotchett was born on 14 October 1853 at Pope, Illinois, also reported as Missouri; also reported as Oct 1852. He was the son of Stephen Coe Crotchett and Polly Clark. John Owen Crotchett married Louisa Jane Zebley circa 1878 at Girard, Kansas. John Owen Crotchett died on 30 December 1931 at Pittsburg, Crawford, Kansas, at age 78. 1 March 1885 Baker, Crawford, Kansas He appeared on the census of 1 March 1885 at Baker, Crawford, Kansas. 1 March 1895 Cherokee, Crawford, Kansas He appeared on the census of 1 March 1895 at Cherokee, Crawford, Kansas. 1 March 1905 Baker, Crawford, Kansas He appeared on the census of 1 March 1905 at Baker, Crawford, Kansas. [S248] U.S. Federal Census 1860 U.S. Federal Census, by Ancestry.com, Page 25. Dwelling 169. [S246] U.S. Federal Census 1880 U.S. Federal Census, by Ancestry.com, NA Film Number T9-0378 Page Number 158C. [S245] U.S. Federal Census 1900 U.S. Federal Census, by Ancestry.com, ED90. Dewlling 62. [S244] U.S. Federal Census 1910 U.S. Federal Census, by Ancestry.com, ED76. Dwelling 167. Name Variation Minda Susan Crotchett was also known as Amanda. Minda Susan Crotchett was born circa 1852 at Pope, Illinois. She was the daughter of Stephen Coe Crotchett and Polly Clark. Name Variation James S. Crotchett was also known as Jim. James S. Crotchett was born on 14 February 1858 at Golconda North, Pope, Illinois, also reported as Missouri; also reported as Feb 1859. He was the son of Stephen Coe Crotchett and Margaret Rodgers. James S. Crotchett married Anna Roe after 1880. James S. Crotchett died on 15 August 1936 at Paducah, Kentucky, at age 78. [S246] U.S. Federal Census 1880 U.S. Federal Census, by Ancestry.com, NA Film Number T9-0389 Page Number 501D. Name Variation William Crotchett was also known as Will. Name Variation William Crotchett was also known as Willie. William Crotchett was born circa 1862 at Golconda North, Pope, Illinois, also reported as Missouri. (?) McKee was born at Virginia. Emma McKee was born circa 1853 at Illinois. She was the daughter of (?) McKee. Married Name circa 1910 As of circa 1910,her married name was Crotchett. Mary S. Walker was born on 31 December 1890 at Missouri. She married Leon Dow Crotchett, son of Thomas Jefferson Crotchett and Bell Carrie Schoonover, circa 1910 at Miami, Kansas. Mary S. Walker married Leon Dow Crotchett, son of Thomas Jefferson Crotchett and Bell Carrie Schoonover, after 1930 After having a son, L.D. with second wife Mary, he remarried to Mary Crotchett (his first wife). They live in Harlingen, Texas. Mary S. Walker died in March 1981 at age 90. 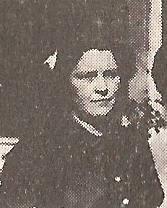 Mary S. Walker obtained US Social Security Card at Kansas; last residence Harlingen, Cameron, Texas. Name Variation William Howard Crotchett was also known as W. H.
Name Variation William Howard Crotchett was also known as Howard. He was born on 20 August 1904 at Louisburg, Miami, Kansas. He was the son of William Luther Crotchett and Hester B. Gaul. 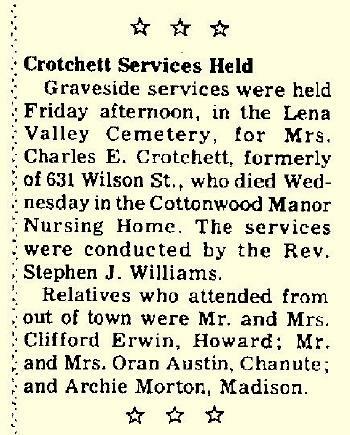 William Howard Crotchett married Delores Stevens on 21 June 1936 at Baptist Church, Louisburg, Kansas. 1 March 1905 Wea, Miami, Kansas William Howard Crotchett appeared on the census of 1 March 1905 in the household of William Luther Crotchett at Wea, Miami, Kansas. [S244] U.S. Federal Census 1910 U.S. Federal Census, by Ancestry.com, ED143. Sheet 7A. Dwelling 91. [S243] U.S. Federal Census 1920 U.S. Federal Census, by Ancestry.com, ED149. Dwelling 134. [S250] U.S. Federal Census 1930 U.S. Federal Census, by Ancestry.com, ED61-25. Dwelling 57. Name Variation Willard Olin Crotchett was also known as Olin Williar. Willard Olin Crotchett was born on 1 September 1906 at Louisburg, Miami, Kansas. Willard Olin Crotchett married Dora Dunn on 17 September 1932 at Christian parsonage, La Cygne, Kansas. Willard Olin Crotchett died in June 1987 at age 80. Willard Olin Crotchett obtained US Social Security Card at Missouri; Last residence Louisburg, Miami, Kansas. 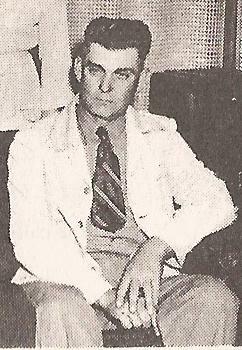 Wendell Morrow Crotchett was born on 9 August 1908 at Louisburg, Miami, Kansas. Wendell Morrow Crotchett married Lola Dean Williams on 20 August 1938 at Baptist parsonage, Minneapolis, Kansas. He died in March 1987 at age 78. Wendell Morrow Crotchett obtained US Social Security Card at Missouri; Last residence Louisburg, Miami, Kansas. Married Name 19 January 1941 As of 19 January 1941,her married name was Wolf. 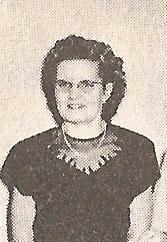 Ferne Pauline Crotchett was born on 25 August 1919 at Deming, Luna, New Mexico. She was the daughter of Perry Allen Crotchett and Myrtle Emily Dixon. 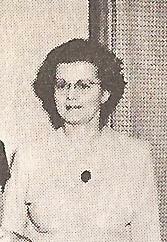 Ferne Pauline Crotchett married Donald Albert Wolf on 19 January 1941 at Deming, New Mexico. 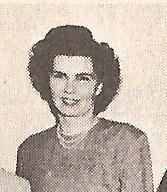 Ferne Pauline Crotchett died on 14 December 2007 at Deming, Luna, New Mexico, at age 88. She was buried after 14 December 2007 at Mountain View Cemetery, Deming, Luna, New Mexico. [S243] U.S. Federal Census 1920 U.S. Federal Census, by Ancestry.com, Precinct #1. ED68. Dwelling 774. [S250] U.S. Federal Census 1930 U.S. Federal Census, by Ancestry.com, ED15-2. Dwelling 15. Anna K. Crotchett was never married. She was born on 23 February 1903 at Missouri. She was the daughter of Charles Dickens Crotchett and Anna Marie Kraemer. Anna K. Crotchett died on 18 January 1989 at age 85. She was buried on 23 January 1989 at Rose Hill Memorial Park, Tulsa, Tulsa, Oklahoma. Anna K. Crotchett obtained US Social Security Card at Oklahoma; last residence Tulsa, Tulsa, Oklahoma. [S243] U.S. Federal Census 1920 U.S. Federal Census, by Ancestry.com, Stamp 162. ED 231. Dwelling 65. [S250] U.S. Federal Census 1930 U.S. Federal Census, by Ancestry.com, ED72-153. Dwelling 152. Charles Kraemer was born circa 1844 at Germany. Herman Ohlrichs was born on 1 October 1896 at Iowa. He was the son of Fritz J. Ohlrichs and Gardine Elizabeth Stouffer. Herman Ohlrichs obtained US Social Security Card at Minnesota; last residence California. [S245] U.S. Federal Census 1900 U.S. Federal Census, by Ancestry.com, ED109. Dwelling 56. [S244] U.S. Federal Census 1910 U.S. Federal Census, by Ancestry.com, ED113. Dwelling 50. [S243] U.S. Federal Census 1920 U.S. Federal Census, by Ancestry.com, ED132. Sheet 2B. Dwelling 33. [S243] U.S. Federal Census 1920 U.S. Federal Census, by Ancestry.com, ED135. Dwelling 125. [S250] U.S. Federal Census 1930 U.S. Federal Census, by Ancestry.com, Year: 1930; Census Place: Fenton, Murray, Minnesota; Roll: T626_1107; Page: 2B; Enumeration District: 12; Image: 0899. 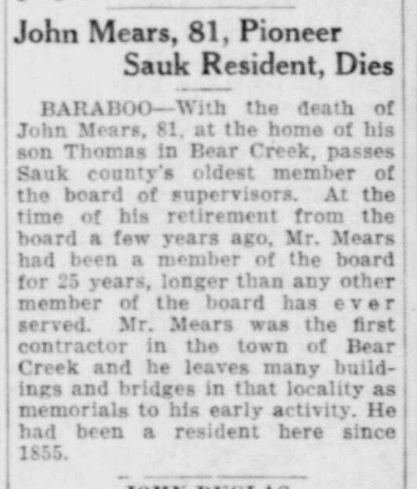 John Mears was born in May 1853 at Canada also reported as October 1852. He was the son of Andrew Mears and Margaret Howard. John Mears married Helen Farrell, daughter of Patrick Farrell and Julia Harrington, on 25 November 1879 also reported as 25 Nov 1880. 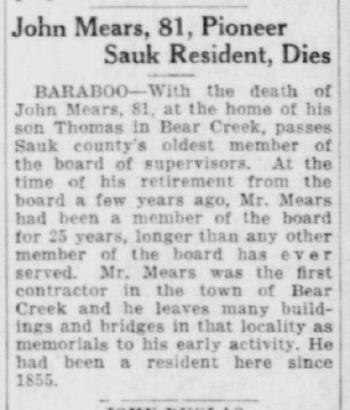 He died in January 1933 at age 79 John Mears obituary. he still owns and manages as a general farming and stock-raising enterprise. Besides farming he has also long been active as a builder and contractor. A capable man in the management of his. own affairs, Mr.
Julia, twins, born in 1917. [S180] Wisconsin Sauk Co Cemetery Records Vol 6, page 16. [S246] U.S. Federal Census 1880 U.S. Federal Census, by Ancestry.com, Dwelling 84. ED264. Sheet 9. [S245] U.S. Federal Census 1900 U.S. Federal Census, by Ancestry.com, ED 129. Dwelling 58. [S244] U.S. Federal Census 1910 U.S. Federal Census, by Ancestry.com, ED110. Dwelling 70. Sheet 4B. [S243] U.S. Federal Census 1920 U.S. Federal Census, by Ancestry.com, Dwelling 162. ED160. [S250] U.S. Federal Census 1930 U.S. Federal Census, by Ancestry.com, ED56-8. Dwelling 165.